This article was written by Olga Mack, originally published on Above the Law. I do a lot of speaking to professionals, including lawyers, about demystifying board service. No matter how often I speak, the same questions often come up. One of the most common is: “Is serving on a nonprofit board a good way to start a for-profit board journey?” The short answer is: “Maybe.” Depending on how well the board is run, what you do there, and who else serves with you, serving on a nonprofit board may be a great jumping-off point for your for-profit board service. 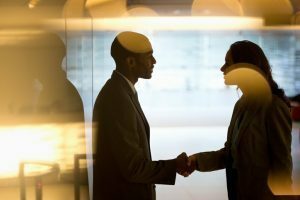 If you work for a company that acquires other companies, has subsidiaries, or has other related businesses, and you are in a senior position, consider asking to serve on a board of directors of one of those related businesses. This is a relatively safe way to get into board service because you are already familiar with the business, industry, and main stakeholders. The decision-makers may be excited that you’ve volunteered for an extra assignment. They may also be glad to promote or give you this recognition when there may not be other obvious opportunities to do so. Many companies abroad operate or do business in the United States. They often prefer for their prospective board directors to (in addition to having substantive expertise in the industry) know the United States market or understand the local industry, customs, or regulatory landscape. Moreover, many companies outside of the United States operate in jurisdictions that have explicit diversity requirements (for example, France requires 30 percent of its public directors to be women). Therefore, these foreign companies may cast a very broad net and be willing to recruit professionals outside of their country when they fill board of directors positions. Joining a foreign private or public company board is an excellent opportunity to network, learn about your industry globally, and build a director portfolio. A startup is a new business that is still being built. For new entrepreneurs, starting their own company is a huge undertaking. Most of them think that a startup board is not of importance, at least for the groundbreaking process. Over time, many startups that survive the first few years may rethink this position as they educate themselves about their industry, their business, and the value board members bring. Often the need for a board arises if there is an investor who demands that a board be formed. A board may also become necessary if an entrepreneur wants to address certain needs of her company. The people an entrepreneur chooses for her board are critical to her business’ performance. As time progresses, she may need to involve more people with certain expertise, knowledge, or experience. Executives, senior management officers, former regulators, and industry leaders are among the people who may be included on a startup’s board of directors. They may become key decision makers and even be hands-on involved in a startup. Startup boards often offer valuable professional opportunities and are a great way to start your board journey. They are excellent ways to network, learn more about industries, and build a successful record of guiding businesses through a critical stage. Advisory boards exist to offer fine expertise to other boards or executives such as the CEO. Advisory boards also complement other functional areas of the organization, such as the management team or task forces. For any startup venture, advisory boards should be highly prioritized. One can set up an advisory board as part of the initial planning stage, but it will often turn out to be the pioneer for your organization. A well-managed and well-structured advisory board can enhance the bandwidth and ensure the right outcome for an organization. These are usually non-governing boards with no fiduciary duty. Because of this, some don’t believe that advisory boards should be called boards. Even if you prefer to call them “councils” instead of boards, these opportunities still merit consideration. Advisory boards often offer valuable professional opportunities and are a great way to start your board journey. They provide a good first introduction to corporate board service. However, because these can be so variable, if you join one, consider being clear about the expectations and what you will be able to contribute. Although a nonprofit board may be the obvious choice for starting your board journey, it’s important to only take that route if you are truly passionate about the cause. Nonprofit board service is a highly important endeavor in its own right, not just as a stepping stone to a larger for-profit board service goal. If you’re looking for a more appropriate, and perhaps even more advantageous “starter board,” take a look at opportunities falling into one of these four categories. You will not only give yourself a great jumpstart for your for-profit board service journey, but also ensure that you are contributing to the best of your ability.